I believe surfing is different to some other sports. The amount of time you need to spend physically learning is quite high, so anything you can do to improve little by little is important. If you are learning to surf you need to be warm enough. So to ensure you can stay in the water as long as possible, a good wetuit is a must. In addition to this you will usually want to learn on a soft foam surfboard with lots of volume. If you are learning to surf and weigh anywhere between 120 -200lbs you should opt to learn on a foam surfboard between 7ft and 9ft long for the first 10-20 sessions. Beyond that it’s common for folks to move onto hard Epoxy minimals or longboards – that said I would not see it as a bad thing for people to spend their first 50-60hours learning to surf on foam boards. When most people learn to surf they have it in their head that they want to ride surfboards that the pros do. Surfing can really be a bit different to other sports. For example – if you played cricket for a while you could buy the same cricket bat as a pro cricketer and it may help your game. If you played football for a while and bought the same boots as Rooney, they may be really comfortable and help you kick the ball better. But with surfing following this logic doesn’t always work because it can take so many years to build up the skills level you really need to get the benefit of using the small dimension surfboards that pros use – an remember they are often surfing in much higher quality waves than we typically get here in the UK! So, if your going to buy a surfboard, my tip would be don’t rush into buying the smallest board possible and don’t be mislead by sales staff. Remember they are often on commission, and so may not always have your interests at heart. If your keen to buy a surfboard try and get some objective opinion about your current standard of surfing at that time…ideally from someone who will tell you the truth! Just because a mate has a 5’10 x 18.5’’ shortboard he wants to sell, don’t immediately jump in and buy it if you’ve only been surfing 3 times, and weigh 180lbs. 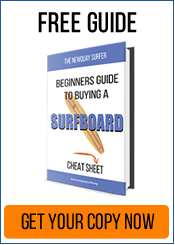 The issue of making sure your surfboard has enough volume has been covered before on the site, but if you are learning to surf you typically want to stick to a surfboard with lots of volume…maybe for your first 50 surfs at least. Though it sounds obvious lessons are important. A common mistake made by some folks is to only have one or two surf lessons – which seems to be based on the assumption that this is all they need to know to surf and all that is required from then on, is to practice. What can then happen is they hire hard surfboards, ignore surfing etiquette and drop in without realising. Sometimes you’ll get a situation of upset locals, while learners are more likely to injure themselves and not improve that much. Most gripes I hear from locals is usually about surfers at busy beaches who really should be on supervised lessons but instead are on hired hard surfboards. So keep up the lessons! Chances are when you start surfing you have a group lesson. These are usually one instructor to 5-10 students. Have at least 5 if not 10 of those lessons, because one or two supervised lessons is really not enough for most people. Once you have had many supervised group lessons, and if you still want to progress, consider having a further 4-5 one-to-one lessons. The benefit of one-to-one lessons is that your instructor can tailor the lessons towards your sticking points, and dedicate the whole session to helping you improve. With a group lesson of 10, you’re only really getting 10% of the surf instructors attention – with a one-to-one lesson your getting 100%. Once you have a warm wetsuit, the right board and you are building your confidence from lessons, there are other ways to start learning. As you get more confident and can comfortably paddle out back, try and identify one or two surfers you think are surfing well. Watch where they sit in the line up to catch waves, look at where they take off and how they drop onto the wave, what do they do next? How do they surf the waves? Try and absorb this. Whilst you may not be able to replicate exactly what they do, you can usually learn a lot from it. Sometimes the folks surfing well can be local, or have some local knowledge – they may have an idea of how the waves break, where to be to take off and so on. Even if you have a bad day catching waves, if you can watch others in the water and learn from them how to get better, you’re spending productive time in the water. If you come to Newquay you can’t really get away from surf DVDs. They play round the clock in most of the popular bars – usually its footage from Oz, Indo, Hawaii or Central America. Basically they tend not to be showing the types of waves we get in the UK. So in my opinion, whilst watching people riding 10 ft barrels is entertaining, when you are learning to surf as a beginner, watching this sort of DVD will not really help you much. That said – you can learn from watching instructional surf DVDs, so instead of watching Laird Hamilton charge 30ft Teahupoo every night it’d be wise to spend at least half of that time watching instructional videos either online or on DVD. Surprisingly there are not that many instructional surf DVDs around, but there are a couple of good UK ones. 110% surfing Volume 1 and Volume 2 are probably the best on the market – click here – Volume 1 is the one to watch if you are new to surfing. It starts off basic, but by the end of the DVD it does get fairly advanced. This really can be an excellent way to learn. Ideally go to the live surf competitions if you can and watch from the beach. There are a number held around the coast in the UK each spring to autumn time. Many of the major ones are held in Newquay. If you can’t get to a local national comp, then check out the live video streams of the international events. 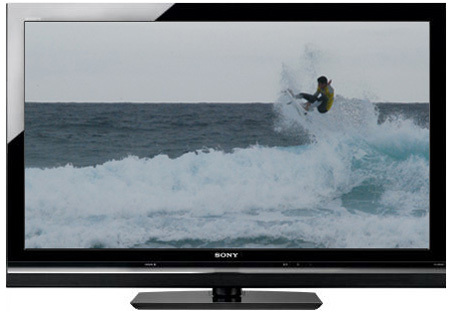 The streaming technology for these live surf events has improved significantly in the last 2 years so it’s possible to hook up your laptop to your 40inch plasma. I make a point of saying watch it “live” rather than edited highlights because you want to see the not-so perfect bits too. Watching live means you are not watching some edited glossy DVD that is a compilation of the surfer’s best waves over a year, but instead you are able to see how the surfers react in real time. Watching live allows you to see the decisions the surfers make taking waves, how they approach and make selections, their mistakes, how they respond in real-time and so on. I’m not out to bash all surf movies, but personally I find a lot of them to be eye-candy, and not that useful for a beginner learning to surf. Another reason live surf comps are useful when you’re learning to surf is that the commentary on the WQS and World Tour events is usually done by ex-pro surfers. So the live commentary is not only entertaining but informative too. The insights given can really help with understanding surfing much better. This is a bit of an old school solution, but there are some useful tips contained in books about surfing. A bit like the DVDs there are not that many instructional books out there on surfing. If you head into most large bookstores in major cities you’ll struggle to find any on the shelves. Its at this stage you realise surfing is a niche sport in the UK and DVDs lend themselves well to the 3-dimensional nature of the sport, however there are a few useful books worth a look if you are keen to learn more. My final tip, which could be your biggest eye-opener, is to persuade someone to video you surfing for an hour or two. As we learn we get a self-concept of how we surf and how we look when we ride waves. Perhaps the bad news is,we usually think in our head we have awesome style, and are riding waves like a pro – until we see ourselves on video that is! Whilst having footage of you riding your local break may shatter a deluded belief that you surf like Occy at Bells, or are killing it like Dane Reynolds…it will help you learn. Video is a massive learning opportunity and it’s something you can go back to and refer to again and again. Just one video session of you surfing and catching 10 waves could be a useful reference for learning for many months to come. Ideally get someone to film you with the camera on a tripod. 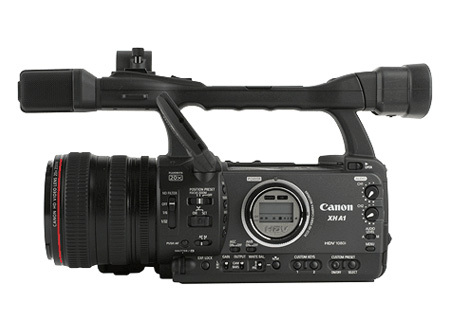 Try and get footage of you doing what you think you normally do. This way you can watch how you pop up, bottom turn, even how you duck dive and so forth. The aim of the video footage is not to make you look cool (more and more people seem to like to use GoPros for that purpose) but to show you how you actually look when you surf and how you can improve. Surfing is not an easy sport, it takes time and in reality it takes many, many years and innate skill, to get to the standard of the top surfers you see in magazines. You may never ever get to that standard no matter how hard you try – but you could still learn to become a competent surfer. And if you are older and are learning to surf, you can accelerate your learning by avoiding some of the pitfalls. Make sure you have the right equipment and take more lessons than the average person. Then have one-to-one sessions too. Get in the water as often as you can and watch how good surfers take waves. When you are not in the water keep fit, but also watch instructional surf DVDs and watch the live comps. You can also swot up and read if you’re a keen reader. And finally get someone to video you and analyse it. Ok – those were the Newquay Surfer top 7 tips for beginners to improve their surfing. Put them all together and I reckon you’ll be racing down the line and busting big hacks and turns before you know it! Do you have any good surfing tips? 7 steps to improve surfing…apart from just practising in the water. Lots of people try out surfing… maybe once or twice…usually they get the bug, and they want to get better. I believe Surfing is different to some other sports. The amount of time you need to spend physically learning is quite high so anything you can do to improve little by little is important. 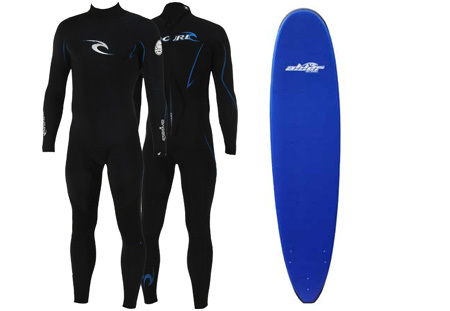 If you are learning you need to be warm enough – so a good wetsuit, and you need a soft foam board with lots of volume. In my opinion, if your learning to surf and you weigh anywhere between 120 -200lbs you should really opt to learn on a foam surfboard between 7ft and 9ft long for the first 10-20 sessions. Surfing is just a bit different to other sports. So, if your going to buy a surfboard, my tip would be don’t rush into buying the smallest board possible, and don’t be mislead by sales staff (remember they are often on commission and don’t always have your interests at heart). If your keen to buy a surfboard try and get some objective opinion about your current standard of surfing at that time – ideally from someone who will tell you the truth! Just because a mate has a 5’11 x 18.5’’ shortboard he wants to sell, don’t immediately jump in and buy it if you’ve only been surfing 3 times and weigh 180lbs. The issue of making sure your surfboard has enough volume has been covered before on the site, but if you are learning to surf, you typically want to stick to a surfboard with lots of volume…maybe for your first 50 surfs at least. This seems obvious, but it seems to be a common mistake that too many people have one or two surf lessons and think they can surf….or that is all they need to learn to surf, and now all they need to do is practice. What can happen is that they start hiring hard surfboards, not observing surfing etiquette, dropping in, upsetting locals, getting injured and don’t improve that much. In fact most of the gripes you will find about busy beaches tend to be aimed at people who should really be on supervised lessons but instead are on hired hard surfboards. Chances are when you start surfing you have a group lesson, these are one instructor to 5-10 students. That’s cool, have at least 5 if not 10 of those lessons because one or two supervised lessons is really not enough. Once you have had many supervised group lessons, then if you still want to progress consider having a further 4-5 one to one lessons. The benefit of the one-to-one lessons is that your instructor can tailor the lesson towards your sticking points and dedicate the whole session to helping you improve. With a group lesson of 10, you’re only really getting 10% of the surf instructors attention. With a one-to-one lesson your getting 100%. I say this, not because I’m being paid by Newquay Surf School, but from personal experience. From memory I think I had around 10-15 group lessons and around 10 one-to-one lesson all within around 2 months before I went out and surfed on my own on a hard surfboard, and whilst at first it felt like I was held back compared to some who were hiring boards, in the end it was advantageous and really helped my progress. Once you have a warm wetsuit and the right board and you are building your confidence from lessons there are other ways to start learning. As you get more confident and can comfortably paddle out back try and identify one or two surfers who you think are surfing well. Watch where they sit to line up to catch waves, look at where they take off and how they drop onto the wave, what they do next and how they surf the waves – try and absorb this. Whilst you may not be able to replicate what they do, you can usually learn a lot from it. Often the guys surfing well may be local, or have some local knowledge – they have an idea of how the waves break, where to be to take off and so on. Even if you have a bad day catching waves, but you can watch others in how to get better, you are spending productive time in the water. So in my opinion, whilst watching people riding 10 ft barrels is entertaining, when your new at learning to surf this will not likely help you all that much. That said – you can learn from watching instructional surf DVDs and instead of watching Laird Hamilton charge Teahupoo every night it’d be wise to spend at least half of that time watching instructional videos either online or on DVD. 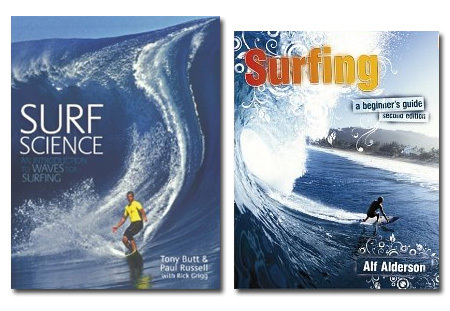 Surprisingly there are not that many instructional surf DVDs you can buy around, but there are a couple of good ones. – 110% surfing Volume 1 and Volume 2 are probably the best on the market. Volume 1 is the one to watch if you are new to surfing. It starts off basic, but by the end of the DVD it does get fairly advanced. Watching live means your not watching some edited glossy DVD that is a compilation of the surfer’s best waves over a year, you are able to see how the surfers react in real time. Watching live comps means you can see the decisions the surfers make taking waves, how they approach waves and make selections, their mistakes, how they read waves and respond in real-time. I’m not out to bash surf movies per se – but I personally find a lot of them to be more eye-candy and not that useful for a beginner. When you are learning to surf you can probably learn a lot more from watching live surf comps in shoulder high waves, than watching Rob Machado tube riding perfect waves in Indo- if you accept the fact it took them 6 months to get that footage. Another reason live surf comps are useful when you’re learning to surf is that the commentary on the WQS and ASP events is usually done by ex-pro surfers. So the live commentary is not only entertaining, but informative too! The insights given can really help with understanding surfing much better. Its at this stage you realise surfing is a niche sport in the UK and DVDs lend themselves well to the 3-dimensional nature of the sport, however there are a few useful books worth a look if your learning. My final tip – which could be your biggest eye-opener – is to persuade someone to video you surfing for an hour or two. Perhaps the bad news is, we usually think in our head we have awesome style and are riding waves like a pro, until we see ourselves on video! Whilst having footage of you riding your local break may shatter your deluded belief that you surf like Occy at Bells, or are killing it like Dane Reynolds…it will help you learn. Video is a massive learning opportunity and it’s something you can go back and refer to again and again. Just one video session of you surfing and catching 10 waves, could be a useful reference for learning for many months to come. Ideally get someone to film you with the camera on a tripod. Try and get footage of you doing what you think you normally do. This way you can watch how you pop up, bottom turn, even how you duck dive and so forth. After all the aim of this is not to get video footage of you looking cool – the chances are you’ll look awkward, but that’s fine, you can learn from it. Surfing is not an easy sport, it takes time and in reality it takes many, many years and innate skill, to get to the standard of some of the top surfers you see in magazines. However if you are older and are learning to surf you can accelerate your learning by avoiding some of the pitfalls. Make sure you have the right equipment and take more lessons than the average person – and then combine with one-to-one sessions too. When you are not in the water, watch instructional surf DVDs and watch the live comps – plus read some books if you’re a reader. 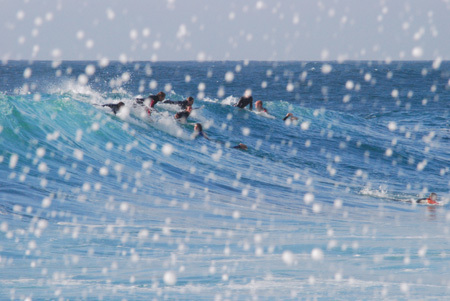 Ok – those were the Newquay Surfer 7 tips for beginners to improve their surfing. Put them all together and you’ll be racing down the line and busting turns before you know it! Best and most honest article I’ve read. I used to surf more in california but since moving away and working too much, I’ve lost my skills. Now looking to get back in the game, starting with and from nothing. I’m going to keep a journal of notes. Maybe there’s a market to write a beginners book. Maybe I’ll ring you up and see if you want to collaborate or put in your two cents. Cheers. Definitely agree with the tip to take lots of surf lessons! to ensure you don’t pick up bad habits it’s best to learn from a qualified instructor! If you’ve got the time, a bit of spare cash and a sense of adventure, why not take your surf lessons in a warm country such as Bali or Costa Rica? The conditions can be perfect and the warm weather/water means you can stay in the water for hours without being put off! Totally agree with lessons being the key (well that and the video playback! We just took a week out and headed to Rapture Camp in Ericeira (Portugal) and had a week of 2 hours lessons with the best instructors I have had the pleasure of meeting! Super good, super informative and really patient (especially as I am a qualified snowboarding instructor and I was constantly using my “boarding stance”)! Cannot wait to go shred again though!